Glorious Gladiator was born today. I think, it's currently a pinnacle of two-handed Savagery builds I've done recently. 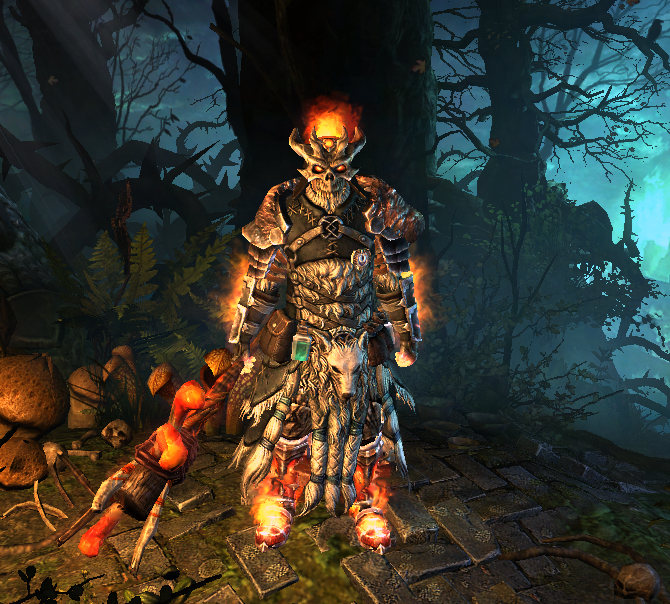 This build uses Fire Savagery, and it can easily farm 150-170 waves with no sweat in under 10 minutes. Update 1.0.7.1: now this build is reliable farmer capable to make sub 8 minute runs; my best time was 7:23. Main damage source of this build is Savagery working via Weapon Damage, and our Weapon Damage is Fire and Physical. The weapon allowing us to do that is freshly buffed Blazerush. The only regular WPS here is Feral Hunger, it deals insane damage as shown in my previous builds. But what is more important, 75% of WPS pool is completely free, and every crit dealt with regular attacks also proc Upheaval. Upheaval is important part of the build's damage, because Blazerush gives juicy 60% weapon damage to it. Counting regular attack damage, every crit deals 258% weapon damage to single target and extra 497% weapon damage as AoE. The best set for Fire is currently Justicar Guard, so I used it. Also it provides strong defensive bonuses. Elemental Harmony rings are BiS, they provide big chunk of flat Fire and nice looking proc. Love 'em. 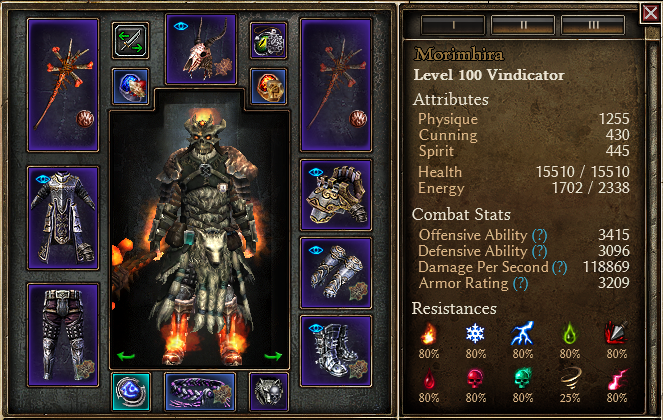 This build have a bunch of racial bonuses: 27% to Undead, 32% to Chthonics, 20% to Eldritch, 18% to Beasts/Beastkin. Racial bonuses provide a good chunk of damage, and most dangerous nemeses are destroyed immediately. This build standing on Inquisitor's Seal and near Wendigo Totem is nearly unkillable. The only danger is Aleks' meteor, try to avoid them. I rolled 54% Physical->Fire conversion on weapon and have 10% on component. Unfortunately, there's no other sources of Physical->Fire conversion available, and we don't have physical RR, so physical damage is kinda wasted. However, it's still helps greatly on Fire resistant nemeses and Shar'zul. Not counting amulets, of course, but this build desperately needs Beronath's OA, +1 to All skills and crit damage. The first appearance of this build used to be Warder, but after a few hours of extensive testing I can say Warder lives much worse than Vindicator, and damage difference provided by extra WPS and soldier's natural tankiness simply don't worth it. Warder also had a lot of troubles with proccing devotions. So, Vindicator ftw. You need Storm Box of Elgoloth to instantly proc Eldritch Fire, Lightning Tether hits 3 times per second. There's no better options for this. You can take Fiend constellation instead of Revenant, but I found Revenant's attack speed, racial bonus and ADCtH more useful. With Fiend it lives worse. Valinov for his advices on Fire damage type. Superfluff for opening my eyes on greatness of WPS skills buffed by autoattack replacers. Last edited by veretragna; 01-16-2019 at 01:15 PM. Hey, man, nice build and all, just wanted to point out that there are two amulets that do phys to fire conversion conversion. Not counting amulets, of course, but this build desperately needs Beronath's OA, +1 to All skills and crit damage. Ah, agree, Beronath's offensive is hard to outweigh sometimes. Also, as Shaman connoisseur I would recommend 1 pt vines/1pt modifier instead of Stormbox - great proccing skill (since it can proc on multiple targets at the same time if devotion proc has no cd) and cheap cc as well. Also also, there is this belt and this weapon augment (I am using latter on my 2h Shaman builds, since it has marvelous OA and flat damage loss is bearable since it's not dw). Also also also, I wonder if maxing Brute Force is worth it for your build since you have the conversion. Agreed on belt and augment, they are possibly better combo than current. Agreed on Brute Force - currently I don't have enough skill points to max it, so I decided to leave it 1pt, but with +1 to Inquisitor from belt it's possible. Disagreed on Vines, I actually don't need CC, but I need to proc Eldritch Fire instantly, so Lightning Tether is best suited for this. When I tested this build as Warder, Eldritch Fire didn't proc from Vines at all when I fought one nemesis at the time So you can imagine how long was that battle. It's a pain, so I'll leave SBoE just for instant proc. Last edited by veretragna; 06-29-2018 at 10:03 PM. Last edited by mad_lee; 06-29-2018 at 11:42 PM. Also Brute Force is % physical damage and flat HP, so I think it's useful anyway. I can invest that points into something else, for example Mogdrogen's Pact itself for flat physical. Many options available. I respect your build, but I tested different appearances of Warder (including yours) and actually biggest problem with it is lack of instant RR. Wind Devils are stupid, they often fly over the targets you're currently dealing with, and chances to proc Elemental storm and Eldritch fire are very low with current skills. So you need to target them manually to keep them debuffing only current nemesis. This leads to no chances to burst out first nemesis spawned, and nemesis fights become slow and painful. Even 159 wave is problem. However, I almost always kill waves 160 and 170 with Warder using mastery and kiting, but I die on wave 161 very often, these myrmidons are super hard to kill with Warder. I can be wrong on this, but I should not recommend Warder for crucible. It's probably viable but very hard to live.